What do you get when you combine lean ground beef, fresh vegetables, Cabot Vermont Sharp Cheddar, lots of yummy seasonings, and pizza dough? 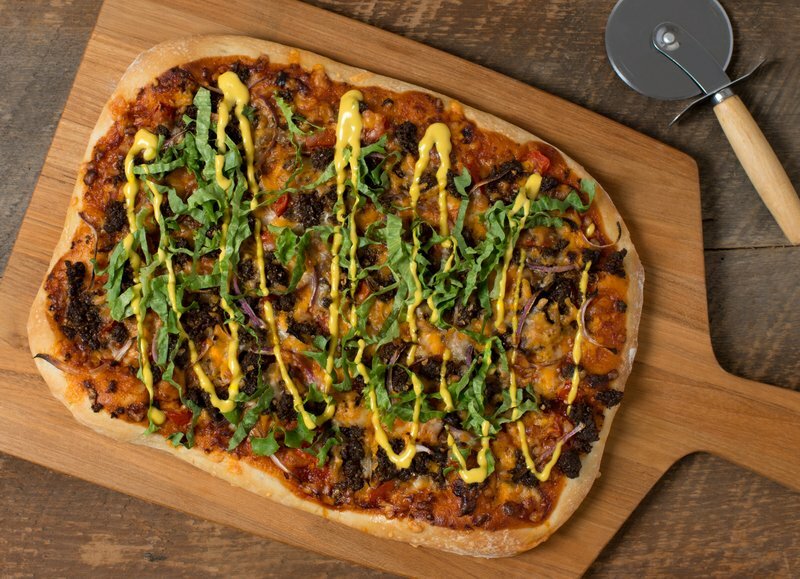 This cheeseburger pizza recipe, that you will absolutely want to try – especially if two of your favorite foods are cheeseburgers and pizza! This recipe makes eight servings, so make it for family pizza night or invite some friends over to enjoy. Once you do, feel free to share the recipe on Facebook, Pinterest, Instagram, and Twitter. To make this awesome cheeseburger pizza, preheat your oven to 450°F and make the mushroom mixture as described in the directions below and then cook with the ground beef until the mixture is browned. Then roll out the prepared pizza dough on a lightly floured surface. Once rolled out to an 18 x 12-inch rectangle, transfer the dough to a parchment-lined baking sheet. Combine &frac13; cup tomato sauce with &frac13; cup barbecue sauce and spread over the dough. Sprinkle 12 ounces of shredded Cabot Vermont Sharp Cheddar over the sauce and top with the mushroom and ground beef mixture, 1 plum tomato (seeded and diced), and ½ of a small red onion (thinly sliced). Bake the cheeseburger pizza until golden, approximately 20 to 25 minutes. Sprinkle ½ cup shredded lettuce over the pizza. Stir ¼ cup light mayonnaise and 2 tablespoons yellow mustard together and drizzle over pizza (Note: To get an even drizzle, place the mayonnaise and mustard mixture into a re-sealable plastic bag and snip off a small portion in the corner to pipe onto pizza). Cut into appropriate portions, serve, and enjoy every bite. Craving more pizza recipes? Our Tex-Mex Meatball Pizza has just the right amount of kick when you’re in the mood for a more spicy pizza. As a cooperative of over 800 farm families, our mission is to make the highest quality and best tasting dairy products around. We make sure to only feature our very best recipes for you and your family to enjoy. We’d love for you to rate and review this cheeseburger pizza recipe once you’ve given it a try. PLACE the mushrooms in a food processor fitted with a metal blade. Pulse until finely chopped. Heat the oil in a large, nonstick skillet set over medium-high heat. Add the mushroom mixture, ground beef, seasoning blend, salt and pepper. Cook for 10 minutes until mushroom mixture is browned. PREHEAT the oven to 450°F (230°C). Roll the dough out, on a lightly floured surface, into an 18 x 12-inch rectangle; transfer to a parchment-lined baking sheet. Stir the tomato sauce with the barbecue sauce and spread over the dough. Sprinkle cheese over the sauce; top with mushroom mixture, tomatoes and red onion. BAKE for 20 to 25 minutes until golden. Stir the mayonnaise with the mustard. Sprinkle the lettuce over the pizza and drizzle with mayonnaise mixture*. Cut into portions and serve immediately. *Place the mayonnaise mixture into a plastic re-sealable bag and snip off a small portion of the corner. Pipe the mixture over the pizza to get an even drizzle.